Franken Cash Video Slot Guide & Review - Casino Answers! Franken Cash is a 5-reel, 20-line video slot developed by Microgaming, featuring scatter wins, a free spins feature and a bonus game. You can play the Franken Cash video slot at Bovada. Coin sizes on the Franken Cash slot machine are $0.01, $0.02, $0.05, $0.10, $0.20, $0.25, $0.50 and $1. You can select from 1-20 paylines on a spin on the Franken Cash video slot and from 1-10 coins per payline. You can bet as little as a penny per spin up to the highest total bet of $200 per spin. Franken Cash has a great betting range for casual players and high rollers alike. 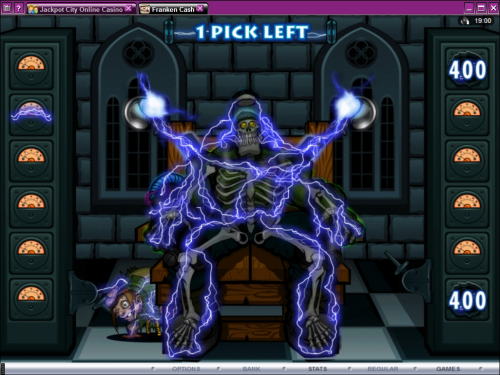 To play Franken Cash with all 20 lines selected and 10 coins bet per line, hit the “Bet Max” button. For all other bets and wagers, hit the “Spin” button. The highest paying symbol on the Franken Cash video slot is the Franken Cash Logo. 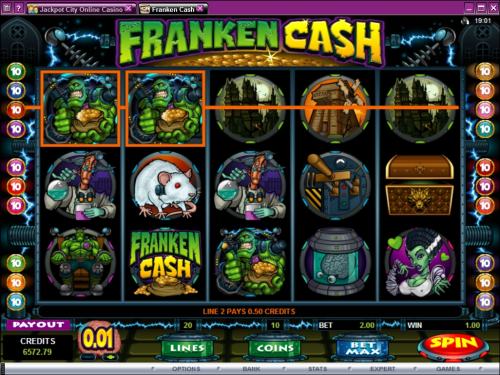 If you hit 5 Franken Cash Logo symbols on an active payline, you will win the 2500 coin top jackpot. Another high paying symbol on the Franken Cash video slot is Franken Cash giving the thumbs up, which will pay out up to 1000 coins. Franken Cash has two scatter symbols. The first is the Electric Switch symbol. 3, 4 or 5 Switch symbols will pay out 2X, 12X or 50X your total bet. 3 or more adjacent symbols will also win you 15 free spins with a 2X multiplier. During the free spins feature, 3, 4 or 5 Electric Switch scatter symbols will pay out 10X, 30X or 100X your total bet. If you can trigger the Franken Cash free spins feature, you can win quite a bit of cash when you play at Bovada! All wins occur on enabled paylines only, except for scatter wins. All wins pay left to right only. Only the highest win per payline is paid out. Payline wins are multiplied by the bet per line. Scatter wins are multiplied by the total bet and added to payline wins. Bonus and free spin feature wins are added to payline wins. Switch Franken Cash over to “Expert” to gain access to its autoplay mode. You can hit the “5X” or “10X” buttons for quick autoplay spins or you can hit the “Auto Play” button for advanced settings. You can play 5, 10, 25, 50, 100, 250 or 500 autoplay spins and set the stop settings either to stop once all spins are complete or stop if a win exceeds or equals $100, $500, $1000, $5000 or $9999. Autoplay will stop on any feature contained in the slot game. You can stop autoplay at any time. Franken Cash boasts excellent presentation, a simple yet cool bonus game and a free spins feature. The payouts aren’t that great, but everything else gets our approval. You can play the Franken Cash video slot when you sign up and make a deposit at Bovada. Can players from the United States play Franken Cash for real money? American players cannot play the Franken Cash online slot for real money at this time. For a couple of Halloween video slots you can play, you can check out Scary Rich and Scary Rich 2 at Vegas Days Casino. What is the wild symbol on the Franken Cash slot game? A wild symbol is conspicuous by its absence on Franken Cash. However, Franken Cash does offer two scatter symbols that will both award you with scatter wins. Is there a Franken Cash Flash game available that can be played for free? Right now, Franken Cash is not being offered at the Instant Play casinos at Bovada. However, there are 200 other games available, with many Halloween slots included.